This workbook accompanies the training manual, The Language of Justice: Interpreting for Legal Services. It offers interpreters and trainers a chance to practice some of the skills taught in The Language of Justice. Like the training manual, the workbook focuses on the U.S. legal system. Yet almost all the lessons drawn apply broadly in many countries. 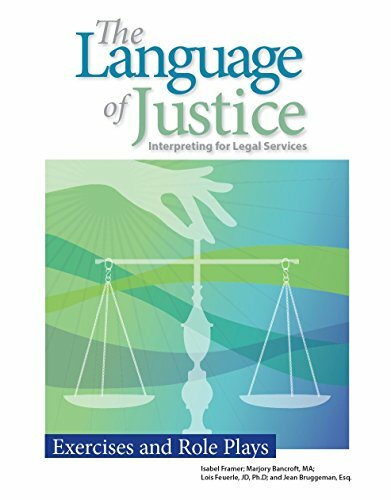 This valuable resource follows The Language of Justice curriculum and gives interpreters the opportunity to hone their skills with: -	Over a dozen role plays (many translated into Spanish) -	Case studies taken from real-life legal interpreting situations -	Sight translation practice of legal documents (where appropriate!) -	Consecutive interpreting self-recording activities -	Linguistic mediation decision-making and techniques Order this workbook today in order to safely practice legal interpreting - before you're thrown in at the deep end on your next interpreting assignment! If you have any questions about this product by Ayuda, contact us by completing and submitting the form below. If you are looking for a specif part number, please include it with your message.